Plant a tree in memory of Ronald E.
Be the first to share your favorite memory, photo or story of Ronald E.. This memorial page is dedicated for family, friends and future generations to celebrate the life of their loved one. 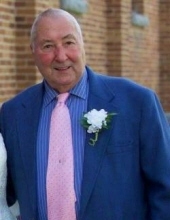 St. Albans – Ronald E. Hemond, a lifelong area resident and former St. Albans City Police Officer passed away early Wednesday, January 23, 2019, at the Franklin County Rehab Center with his family at his side. Born in St. Albans on September 15, 1939, he was the son of the late Ralph and Osilda (Benoit) Hemond. Ron was 79 years old. On April 19, 1958, he married Gloria J. Jewett, who predeceased him on May 24, 2018. They were married for sixty years. Ron attended Holy Angels Grammar School and Bellows Free Academy. In 1957, he joined the Vermont Army National Guard, being assigned to Company A, 3rd Tank Battalion and served in their six month active duty program. He received his honorable discharge following two and a half years of service. He was employed at several area businesses, including, Mongeons Shell Station, St. Albans Co-Op Creamery, H.P. Hood and White Fuels. He also spent time at the City Production Corporation locally known as the “The Old Ice Plant” on Walnut Street where he was Plant Superintendent, until it closed in the 1960’s. Ron then joined the St. Albans City Police Department and retired from there following fourteen years of service as night patrol Sargeant. He also served with the Franklin County Sheriff’s Department for six years and with the Swanton Police Department. Ron owned and operated his own body shop at home on Federal Street at the same time he worked as body shop manager for H. W. Hungerford & Sons until it closed. He then continued full time with his business until he retired. Ron was a very dedicated, hard worker who took great pride in providing for his family. He enjoyed hunting, fishing and spending time with his family. Survivors include his four children; Susan King and her husband, Terrance, of St. Albans, Jody Painter and her husband, Michael, of St. Albans, Allen Hemond and his wife, Pam, of St. Albans and Ronald Hemond and his wife, Anne, of Swanton, as well as his grandchildren, Nathan King and wife, Jessica, Amy Bergeron and husband, Dan, Matthew King and wife, Brianne, Casey Painter and partner, Tim Rousselle, Sarah Painter and partner, Jason Rodriguez, Corey Price and wife, Jessica, Trista Hemond and partner, Nathan Cameron, Ryan Hemond and Rachel Hemond and partner, Anthony Vorse. He is also survived by his great-grandchildren, Lucas, Jacob, Lauren, Olivia, Morgan, Jacqueline, Evan, Chloe and Cohen, and his sister, Mary Czyewski and husband, Van, and several nieces and nephews. In addition to his parents and wife, Gloria, Ron was pre-deceased by a brother, Robert E. Hemond. Ron’s family will receive friends on Monday, January 28, 2019, from 5:00 to 7:00 P.M. at the Heald Funeral Home, 87 South Main Street, St. Albans. A private graveside service and military honors will take place this spring at the family lot in Mount Calvary Cemetery. To send Ron’s family a message of condolence or share a memory, kindly go to his on-line guest book at www.healdfuneralhome.com. To plant a tree in memory of Ronald E. "Ron" Hemond, please visit our Tribute Store. "Email Address" would like to share the life celebration of Ronald E. "Ron" Hemond. Click on the "link" to go to share a favorite memory or leave a condolence message for the family.